Significant antioxidant activity (greater than glutathione). Shown in animals to reduce damage to neuron DNA. Ergothioneine, EGT, is an amino acid – ie, a component of proteins – and a derivative of histidine, containing a sulphur atom. This natural, water-soluble compound was first isolated in 1909 in a parasitic fungus, Claviceps purpurea, or ergot of rye, although it has taken more than a century to synthesize it in the laboratory. It has been given GRAS status (generally recognized as safe) by the US FDA, ie, it is non-toxic. It can therefore be used in functional foods and drinks as well as in supplements. ¤ L-ergothioneine is synthesized from fungi and mycobacteria. Contained in plants, it is ingested by animals and humans from the diet. The main dietary sources are edible mushrooms, black and red beans, oat bran, garlic and certain meat products (liver and kidneys). ¤ In human and animal tissue, L-ergothioneine is concentrated in those organs subject to significant oxidative stress: the liver, kidneys, heart, skin, lungs, spleen, small intestine and blood (particularly in erythrocytes), as well as in ocular tissue and seminal plasma. ¤ Research quickly identified its remarkable capacity for combatting oxidative stress, recognised as an important factor in age-related diseases, and ergothioneine was first used as a drug to treat major liver damage, cataracts, complications of diabetes and heart disease. ¤ Its beauty-related applications were also noted – it can be applied directly to the skin to prevent wrinkles and other signs of aging caused by sun-induced photo-oxidative damage. Naturally present in the skin, this substance counteracts the effects of key mediators involved in skin aging, particularly photoaging. ¤ L-ergothioneine is exceptional in that it can reach the very core of certain cells such as erythrocytes, unlike other classic antioxidants such as vitamins C and E. It actually has a gene which codes for a carrier protein, enabling it to be taken right to the heart of cells. It is thus a potent intracellular antioxidant, as important as L-glutathione. ¤ In addition, it has also been shown to be a powerful chelator, enabling it to bind to toxic heavy metals, while protecting blood cells from all types of damage. ¤ Encouraged by its antioxidant properties, researchers subsequently investigated its anti-inflammatory effects, since ergothioneine acts on, amongst others, the pro-inflammatory cytokine, interleukin. - and finally, when combined with hyaluronic acid, glucosamine, collagen and cat’s claw, it was shown to significantly reduce joint pain and increase joint mobility, associated in particular with poor postural work habits, after just six weeks’ use. ¤ This substance is currently the subject of multiple studies, related to acute respiratory or skin diseases, for example. But common to all the research is a focus on the mechanisms of inflammation and the way ergothioneine acts not so much as a classic antioxidant, but more of an “antioxidant-anti-inflammatory”. 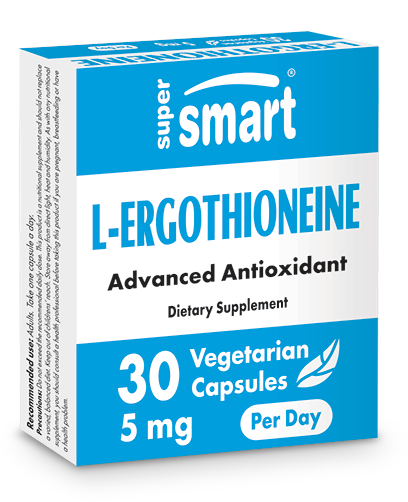 ¤ Another fundamental characteristic of ergothioneine is that it has a very long half-life in the body – around 30 days - compared with the half-life of classic antioxidants of between 30 seconds and 30 minutes. .
Ergothioneine therefore joins the list of potent antioxidants available from the SuperSmart catalogue, which includes alpha-lipoic acid, reduced glutathione and resveratrol. These three compounds are available as single antioxidants, or as part of a combination such as in the optimised formulation AntiOxidant Synergy. For optimal efficacy, it is now possible to combine this synergistic formulation with ergothioneine. While ergothioneine is thus associated with remarkable health benefits in terms of cognitive function, eyesight, immune-modulation, pulmonary health, reproductive function and skin health, it cannot be produced by the body. Vital for healthy cell function, it has been compared by some to a vitamin, and fortunately, this essential substance can now be obtained via supplementation. Other ingredients : Hydroxypropylméthylcellulose, microcrystalline cellulose, magnesium stearate, silicon dioxide.